After the resounding success of the 3rd International Medical Tourism, Equipments, Technology, Exhibition & Conference (IMTEC Oman 2015), the 2016 International Medical Travel Conference and Exhibition (IMTEC) will show considerable growth in all aspects and areas of the show. The event will take place between 28-30 March at Oman Convention & Exhibition Center. The International Medical Travel Conference and Exhibition (IMTEC) takes place from 28-30 March 2016 at the Oman Convention & Exhibition Center and serves as a central meeting point for the regional and international medical travel industry. IMTEC offers a global platform for hospital groups, medical travel organizations and health services companies to boost their international presence and patient network, and gain market share in this growing industry. This event will play host to more than 100 regional and international exhibitors, and is expected to attract an estimated 2,200 attendees from across the world. The IMTEC Conference offers a two-day multi-track agenda that will keep you up-to-date with topics pertinent to the Medical Travel industry. The conference agenda will host an expert speaker panel from across the globe and various specialties. Medical tourism is an increasing phenomenon. With the growing amount of individuals journeying overseas for economical and dependable medical treatments, outsourcing of healthcare solutions and the medical tourism are becoming the preferred buzzwords among the market players and consumers equally. This year, the International Medical Travel Conference and Exhibition (IMTEC) will be held at the Oman Convention & Exhibition Center. Opening in 2016, the centre is set to become an iconic landmark for Muscat and the Sultanate of Oman. Surrounded by nature it overlooks a wadi which is a haven for Oman’s exotic bird life. The Centre is conveniently located only 10 minutes away from the new Muscat International Airport. Enhance your product and boost your brand value. Target key decision-makers for your products and services. Raise your company profile and stand out from your competitors. Reach a target audience of more than 10,000 medical professionals, distributors, dealers and suppliers . Create memorable impact amongst international and regional healthcare professionals. 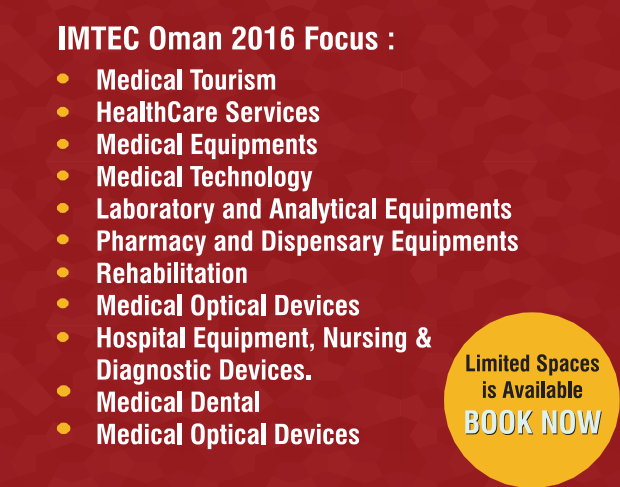 ​Learn More About the Benefits of Attending the IMTEC Oman 2016 by clicking the button below!